Jones Gillam Renz (JGR) has successfully provided our clients with experience, knowledge and creativity since originating in 1945 as Seitz-Jones. 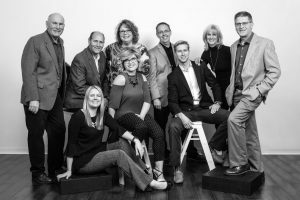 Throughout the years we have evolved and added key associates to our team. The late Russell A. Jones joined the firm in 1956, and John N. Gillam joined in 1959 (and has since retired). The years following, the firm changed names many times, reflecting the addition & subtraction of firm principals, but eventually the firm became known as Jones Gillam Architects. In 1988, John’s youngest son, Jeff, joined the team and became a key player in assisting the firm into the computer technology age. He then incorporated the firm in 1999. Charles Renz joined the firm in 1995 and in 2008 became a principal. This changed the firm’s name, once again, to Jones Gillam Renz Architects (JGR). Now into our seventh decade, we are thankful and proud to still be thriving and offering our expertise & continued service. A key to JGR’s continued success is the dedication of our professional staff and principals. During projects, a principal is routinely assigned to be the project m anager and directly assumes full leadership and responsibility to the owner and team from project inception to completion. As project manager, they coordinate with client representatives, specialists, consultants and staff in all phases of the project, including: programming, design, cost estimating, production and construction administration. JGR is passionate about providing great service, and design solutions to our clients. Jones Gillam Renz emphasizes the “Team Concept”. This concept, also known as “Consensus Building”, is an extremely important ingredient to the overall success of a project. Our approach is to work closely with the clients, staff, consultants, community and others to explore, analyze & critique the project details to ensure the client’s functional & physical goals are achieved. JGR believes that the culmination of experience, versatility and talent of each team member is crucial to achieving design excellence, offering quality service and creating an environment for positive results.